Casting an imposing shadow, General Daniel Morgan strode with confidence and determination beside the rows of blazing campfires at Cowpens — a cow pasture, near present-day Spartanburg, South Carolina. It was the eve of one of the most decisive battles of the Revolution, one that was won through a combination of leadership and adaptability that is typical of a unique American way of war. A fearless veteran of numerous military campaigns, Morgan inspired his men through example. Standing a full six feet, which was unusually tall for the time, Morgan didn’t wear many of the trappings of a typical eighteenth-century military officer, and he carried only a simple sword. As a result, the men felt an affinity with Morgan: he was one of them. His personal battle history was etched deeply across his body. On his left cheek, he bore an angry scar from a ball that entered his neck, passed through his mouth, took out most of his rear teeth, and exited his upper lip. The unforgettable scene is recounted in a new bestselling book called Washington’s Immortals, which chronicles the actions of the elite troops of the Maryland Line, one group of Americans that took part in the battle at Cowpens. This unique book is the first Band of Brothers treatment of the American Revolution, capturing the most important elements of nearly every significant battle of the War of Independence. Morgan faced numerous challenges, most notably how to fight Tarleton’s experienced, drilled British troops with an American force made of fickle militia. A quintessential innovative American, Morgan came up with a novel battle plan. The general’s first line consisted of skirmishers, handpicked men who were crack shots. They would position themselves about 150 yards in front of the militia. He told the riflemen to aim for the officers to soften up the British as they came forward. The second line consisted of militiamen, who, Morgan knew, who were capable of only limited fighting. He asked them to fire a few shots and withdraw through holes in the Continental line, where they would re-form and prepare for a counterattack. The third line consisted of the Maryland, Delaware, and Virginia Continentals. They would remain concealed behind a small rise until their time to face the oncoming British. At that point, the militia, along with cavalry led by Lieutenant Colonel William Washington (a cousin of George Washington) led a counterattack that would envelop the British. Morgan proposed a defense in depth, considered unique during the Revolution. He would seek to delay the advance of the attacker and buy time by having his men fall back to prepared positions as the enemy advanced. This allowed them to inflict additional casualties, exact a high price from the advancing British, and set up a crushing counterattack. The British army had already mastered its style of combat when the war began. It had established rules for its soldiers to follow in battle—a European style of fighting. As the war progressed, it began to see the need to revise those rules, and the British army adapted. Both the American army and the British army were readjusting their forces, tactics, and strategy to fight the Revolution. A race ensued. The winner would be the army that could reshape itself faster. Morgan and the Marylanders were in the forefront of pioneering a highly adaptable American style of combat. The battle began with the bayonet-wielding British infantry charging the first line of Americans in the meadow. “[Morgan] galloped along the lines, cheering the men and telling us not to fire until we could see the whites of their eyes,” recalled one of the American militiamen. When the enemy approached within fifty yards, the Americans began to fire. After taking a couple shots, the American militia retreated. Thinking it was a rout, the Redcoats surged ahead faster. But another line of Patriots lay ahead of them. Howard’s Marylanders waited behind a rise, ready to spring the trap Morgan had laid. As the Redcoats approached, fierce fighting ensued with both sides exchanging musket fire. Tarleton then sent in his cavalry, turning the tide toward the British. At that point, a misunderstood order nearly resulted in disaster for the Americans. An American officer mistakenly thought Howard had ordered him to withdraw. His men turned their backs to the British and began marching to the rear. Thinking the Americans were fleeing the battle, the British surged forward to deliver a knockout blow. Howard corrected the mistake, ordering the troops to halt and turn around. The men did an about face and unleashed devastating fire on the British. Stunned by the unexpected fire, the Redcoats beat a hasty retreat, now pursued by the Americans. A tide of screaming Continentals soon reached the vulnerable British artillery, which had been left nearly undefended. Only a few yards from an artillery piece, which was leveled at them, one of the Maryland officers saw that the artillerist was “about to put a match to it. At this critical moment, [he] ran up, and, with the assistance of his spontoon, made a spring, and lit immediately upon the gun.” In one of the more bizarre and colorful exploits of the Revolution, the Marylander had pole-vaulted onto the artillery piece. He then disabled the match-wielding artillerist and captured the valuable prize. Tarleton attempted to rally his men to no avail, as most of his surviving troops attempted to flee the field. At this point, the militia re-formed and combined with cavalry led by William Washington, and they enveloped the British, capturing or killing many of them. 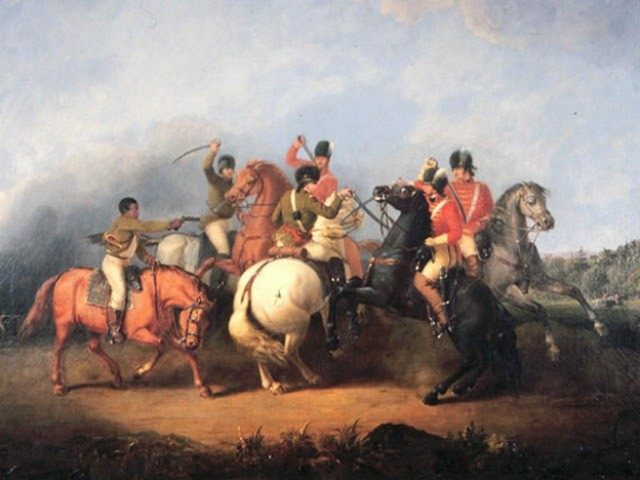 Tarleton responded by charging Washington’s force with a small group of dragoons, and the two officers were soon embroiled in a horseback sword duel. Tarleton made a thrust, which Washington parried, but the action snapped the American’s sword in two. One of the other British officers moved in to strike Washington, but Washington’s African-American orderly drew his pistol and shot the man, saving Washington’s life. Another British officer fired his pistol at Washington, but the bullet missed its mark, hitting Washington’s horse. Thwarted in his attempt to take out the charismatic American officer, Tarleton and a small group of his men fled Cowpens while the bulk of his task force was killed or captured. It was a decisive American victory that set the stage for a momentum shift in the war in the South. America has a unique way of fighting that has become part of our national DNA. In today’s world, decisive victories such as Cowpens have become increasingly scarce. Paradoxically, with a greater reliance on technology, adaptability and leadership are inhibited, and the American way of war is dramatically changing.